My mom’s birthday was this week and she’s off in Australia visiting my brother so I sent her long distance wishes. I also thanked her for all her support and encouragement when it comes to my writing. My mom is my sounding board as well as one of my beta readers. I know, you’re not supposed to use your mom to critique your work, but not only is she a smart lady, she’s well read in every genre, fiction and non-fiction. It’s no secret she loves my writing, but she’s also one of my harshest critics, so it works out well. I’m grateful to have her backing me and picking me up when I need it. She is intelligent, witty, warm and giving and is someone I aspire to be like. I’ve looked up to many different figures throughout my life, depending on the stage of my journey. When I was in school, it was various sports stars. When I was a fitness competitor, I focused on emulating the top Pros. Now that I’m focusing on my writing career, I’ve been thinking about which authors have influenced me, which ones continue to motivate me and which ones I aspire to be like. Isn’t this great advice for writers? 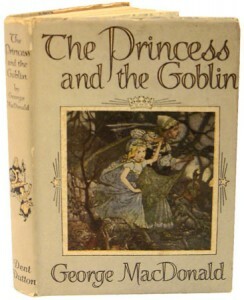 When I was nine years old I wrote my first full length novel, after reading George MacDonald’s books, The Princess and the Goblin. His books ignited my passion for writing. Soon after came the Hobbit and later, The Lord of the Rings. Peter S Beagle’s novel, The Last Unicorn struck the heart of me, like no other book has since. David Eddings and Terry Brooks influenced my fascination with the written word and The Dragon and the George by Gordon R. Dickson is another of my favourites that made me want to sit down and write. When I think of these books, it’s as though they encourage my spirit to take flight. Wouldn’t it be fantastic to provide that same feeling for someone else? More recently, I’ve read some books that I set down in awe and think, “Forget it. I’ll never be this good.” Of course, that only lasts a few seconds, then I pick up the book again and can’t wait to continue to improve my own writing. The Name of the Wind by Patrick Rothfuss is one such book, as well as Horns by Joe Hill. The list goes on. I’ve thrown myself into the world of Urban Fantasy authors and use my favourites (Diana Rowland, Kelley Armstrong, Charlaine Harris, Kim Harrison, Richelle Mead) to study, while digging ” the treasure out of their soul” to learn how to better myself as an author. They’ve set the bar for me to aspire to in the world of Urban Fantasy. The most important thing to remember is that while you may never write like Tolkein or become an icon like Stephen King or Neil Gaiman, what you write is unique because it comes from you. It’s your style, it’s your perspective and individual take on the world. Look up to the masters, hone your craft and never give up. Someday, it could be your work that inspires someone else. What authors did you read that left your mouth hanging open? Which ones made you want to be a writer? Which ones continue to make you want to be the best writer you can be? I’m sure it’s a long list, but are there ones that stand out to you? Which authors leave your mouth hanging open?? What a fantastic post, Sandra! I’ve been reading a lot (A LOT!) of short fiction lately–I’m starting to know good ones by the way they give me goosebumps. I dream of being goosebump inducing, of making someone’s mouth fall open … Thanks for reminding me to stick to my dreams! Thanks, Wendy! Glad you liked it and I KNOW you’re going to be giving LOTS of people goosebumps with your writing!! There’s nothing like reading good books to get me motivated to write! Lately, novels such as Ship Breaker (Paolo Bacigalupi), Little Brother (Cory Doctorow), and The Way the Crow Flies (Anne Marie MacDonald) have really inspired me. Thanks for the post! A thoughtful post on where our inspiration comes from and where we go to refill the well every now and then. I find it really interesting to hear about the books writers say changed them. The Sabriel trilogy by Garth Nix has to be one of my favourtes, and of course Hunger Games, by Suzanne Collins.Thanks Sandra! Great post! Neil Gaiman, as always, leaves my mouth hanging open with how good he is. Terry Pratchett of course, when I grow up I want to be like these guys.